The pattern is Abel the Stitch Explorer by Follow The White Bunny. I had bought this pattern to do leisurely once the baby was born but before you think I'm superwoman I will tell you I was working on it while I had all that waiting time (11 days overdue). All that was actually left was the clouds, which I've done in all the newborn napping time. It is a wonderful sampler and I learnt a lot of new stitches, which I enjoyed doing. Some I'm better at than others but then that's half the point of making a sampler. I really love the finished result and will be framing this for the baby's room. There has been no fabric sewing going on but I did receive this gorgeous bundle of yumminess from The Village Haberdashery. Annie is a superstar and I've ordered a few times from her fabulous shop so please take time to check it out. These are destined to become low volume shapes in my rose star quilt. big brother is rather taken by the cot mobile and the 'magic' remote control! chilling with mummy - both in our onesies!! Don't forget to check out my sponsored giveaway from Fluffy Sheep Quilting and you might just want to head over to Cindy's blog for another giveaway too! Love the stitching, and my favourite photo is that last one of Lois. Gorgeous! 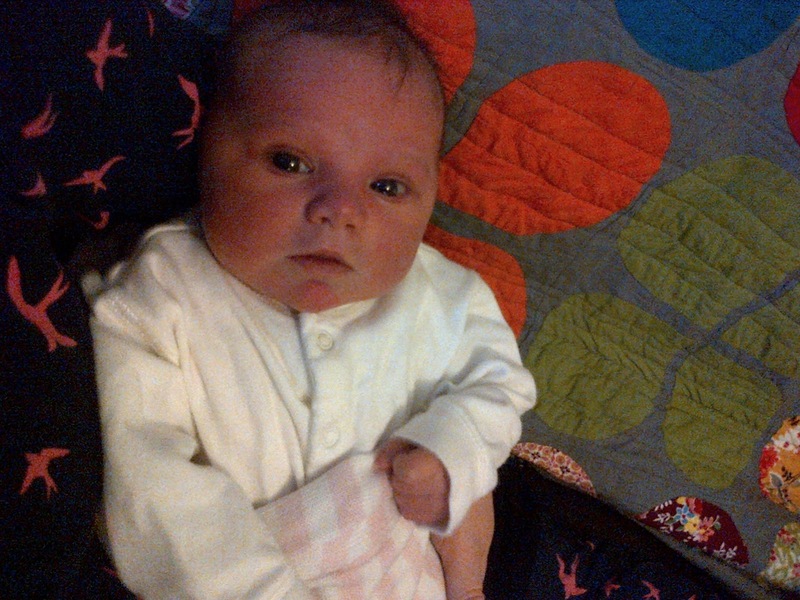 Firstly, Lois is a beautiful baby! Secondly, your hot air balloon is so pretty! Lovely photographs. She looks a very alert little girl! Lovely stitching and even lovelier Lois photos! She is adorable, as is the embroidery. I am glad you are having fun with her. I don't know how you can do anything else but cuddle and look at her. I love the balloon! Honestly I don't know how you even got the clouds done with a newborn and another small one. :) Little Lois is just precious. I could sit and look at her all day. Really pretty and cute pics too. Adorable stitchery and such an adorable little girl! Gorgeous sampler and even more gorgeous baby! She looks very content! haha you two in your onesies! Such a pretty hoop, such a pretty baby - she looks so aware! Cute, both the stitching and the new recipient! Inspired by your last showing of Abel and being a bee mate of Nicole's, I ordered the Sailing Polar Bear (Zaki's choice)a couple of days ago and can't wait to get some DMC and start! Lois is ridiculously cute Lucy - enjoy her and your beautiful family! Great Stitches. Wow cute baby. Best of luck with the newborn. So sweet. That's so beautiful. Baby and Sampler! Oh my, love your Abel and your baby is so sweet! Beautiful stitching! 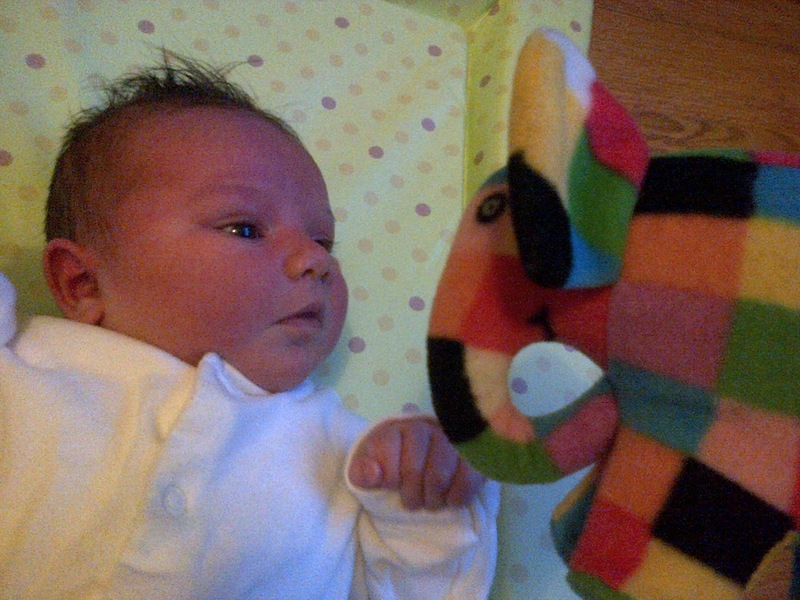 So nice to see the photos of Lois - love the one with Elmer. What a cutie pie! So alert for so little. And your balloon is super cute. Great to learn that many new stitches! Oooh, I love hot air balloons almost as much as I love babies. She's just so squooshy, Lucy! Lucky you to have all the squooshiness! Glad things are well! She's beautiful Lucy! Congratulations. :) I also adore your stitch work. It looks like a fantastic way to make a fun sampler and have a beautiful piece (complete with a wee little mouse!) to display in Lois' room. What a great pattern for a stitch sampler. Your stitches look so perfect to me. Lois is such a super cutie pie!! She is so so cute! Love the idea of a sampler - not being a sampler, this is going to be gorgeous for the baby's room! Beautiful baby and beautiful stitching too! Well done to you on both! That is such a sweet little sampler and Lois is just adorable- and so alert! She almost looks ready to learn how to embroider herself. So much beauty in this post. Your stitch sampler is wonderful, but I think baby Lois steals the spotlight! So sweet! Gorgeous stitching!! And Lois is just sooo sweet :) I will say that everytime you post a pic of her! She is ADORABLE! Blessings to you all, I hope all is going well. Best wishes! Congratulations! What a sweet little girl! Your embroidery is wonderful!